A German Magazine is reporting that Apple and Mercedes Benz have signed a deal whereby Apple will design an in-car maintenance, communication and navigation system for inclusion in Mercedes Benz vehicles from 2009. 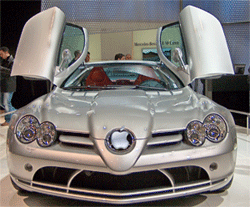 Mercedes will have exclusive rights to the new Apple in-car system for 6 months. The article speculated as to whether the Apple system will rely on Google Maps as the iPhone does, however no firmer details were available. Given the small form factor of the Mini Mac, it’s not a stretch to imagine a similar sized OS X powered unit being built into vehicles.